Robin Coste Lewis's electrifying collection is a triptych that begins and ends with lyric poems meditating on the roles desire and race play in the construction of the self. In the center of the collection is the title poem, "Voyage of the Sable Venus," an amazing narrative made up entirely of titles of artworks from ancient times to the present--titles that feature or in some way comment on the black female figure in Western art. Bracketed by Lewis's own autobiographical poems, "Voyage" is a tender and shocking meditation on the fragmentary mysteries of stereotype, juxtaposing our names for things with what we actually see and know. A new understanding of biography and the self, this collection questions just where, historically, do ideas about the black female figure truly begin--five hundred years ago, five thousand, or even longer? And what role did art play in this ancient, often heinous story? Here we meet a poet who adores her culture and the beauty to be found within it. Yet she is also a cultural critic alert to the nuances of race and desire--how they define us all, including her own sometimes painful history. Lewis's book is a thrilling aesthetic anthem to the complexity of race--a full embrace of its pleasure and horror, in equal parts. 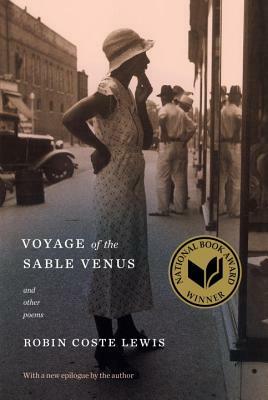 ROBIN COSTE LEWIS, the winner of the National Book Award for Voyage of the Sable Venus, is the poet laureate of Los Angeles. She is writer-in-residence at the University of Southern California, as well as a Cave Canem fellow and a fellow of the Los Angeles Institute for the Humanities. She received her BA from Hampshire College, her MFA in poetry from New York University, an MTS in Sanskrit and comparative religious literature from the Divinity School at Harvard University, and a PhD in poetry and visual studies from the University of Southern California. Lewis was born in Compton, California; her family is from New Orleans.